Business increased 50% since Guaranteed Rate began its branded, direct response campaigns. Guaranteed Rate, the eighth largest retail mortgage lender in the nation and an industry technology leader, is airing what may be the only direct response commercial you will see during the big game. “Guaranteed Rate is unique in that we are a strong direct response advertiser working with a direct response agency, and yet we are running a TV spot in a venue better known for brand-focused advertisements,” said Darren Beck, chief marketing officer at Chicago-based Guaranteed Rate. 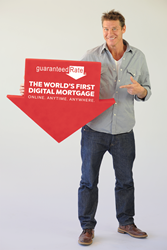 Guaranteed Rate collaborated with Modus Direct to create the commercial. The 30-second spot can now be viewed online. 1. Low, low rates – among the most competitive in the industry. 2. Reputation – top 10 retail mortgage lender in the country. 3. Digital Mortgage – get approved for a mortgage online, anytime, anywhere in minutes. “We do not believe that branding and direct response are mutually exclusive. We have been successful in accomplishing both in our marketing efforts so far, and we are confident that this Super Bowl exposure will do the same,” said Beck. Business increased 50% since Guaranteed Rate began its branded, direct response campaigns in 2014. The company is one of the fastest-growing retail mortgage lenders in the nation. The commercial will air regionally during the big game in Chicago, Boston, Tampa and Salt Lake City, and expand nationwide on February 7, 2016. In addition to the commercial, the integrated campaign includes a social media quiz, email marketing, and game-day party kits to drive engagement and create awareness. Members of the media interested in interviews or additional information should contact Elizabeth Fay, director of public relations at Guaranteed Rate at (773)290-0059 or Elizabeth(dot)fay(at)guarateedrate(dot)com. Guaranteed Rate is the eighth largest retail mortgage lender in the U.S. The company has become The Home Purchase Experts® by introducing the world's first Digital Mortgage and offering low rate, low fee mortgages through an easy-to-understand process and unparalleled customer service. Headquartered in Chicago with approximately 175 offices across the U.S. and licensed in all 50 states, Guaranteed Rate has helped hundreds of thousands of homeowners with approximately $100 billion in home purchase loans and refinances since 2000 and $18 billion in 2015 alone. Guaranteed Rate was ranked No. 1 in Scotsman Guide's Top Mortgage Lenders 2014 honors and was named one of Chicago's Top Workplaces by the Chicago Tribune in four of the past five years. In 2015, was recognized as one of Inc. 5000's Fastest Growing Companies in America. Visit guaranteedrate.com for more information.